Clint Eastwood will make Blu-ray cry-yie-yie this November. Pre-order the Blu-ray here. 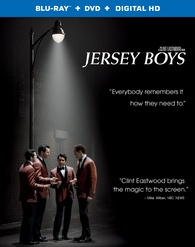 In an early announcement to retailers, Warner Brothers says 'Jersey Boys' will arrive on Blu-ray on November 11. Specs have yet to be revealed, but supplements will include: From Broadway To The Big Screen Featurette; Too Good To Be True Featurette; and "Oh, What A Night" To Remember. Suggested list price for the Blu-ray set is $35.99. You can find the latest specs for 'Jersey Boys' linked from our Blu-ray Release Schedule, where it is indexed under November 11.